The University of Rochester’s Hopeman Carillon sweetens the River Campus air. During the school year–as we march across the Eastman Quadrangle–when the bells ring, you see people reflexively glance upward from their phones and consuming thoughts — hearing and stealing a moment of the sublime. From mid-June to early August–when September still seems distant–we carry our blankets and picnic baskets to the Quadrangle for the Summer Concert performances. Uninterrupted July early evenings, sweetened air, as the sun dips below Mt. Hope. 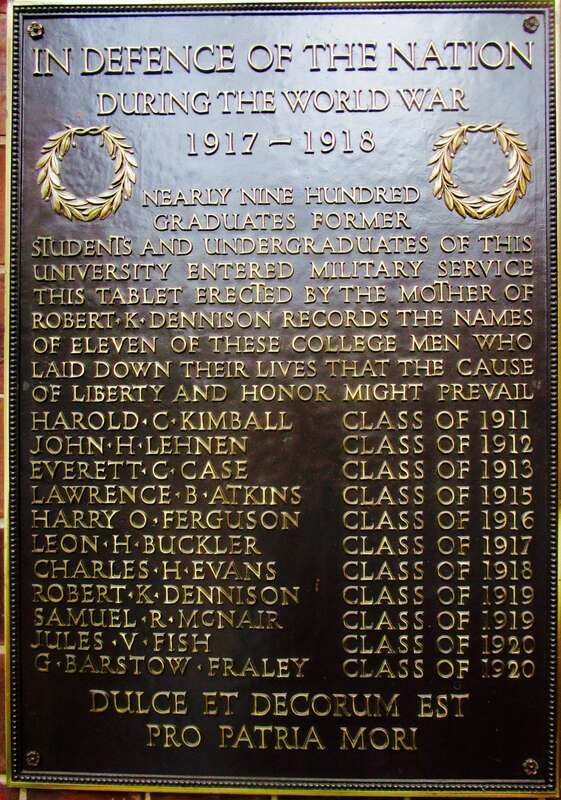 And, on Veteran’s Day, Wednesday the 11th, the carillon will ring on this special occasion. 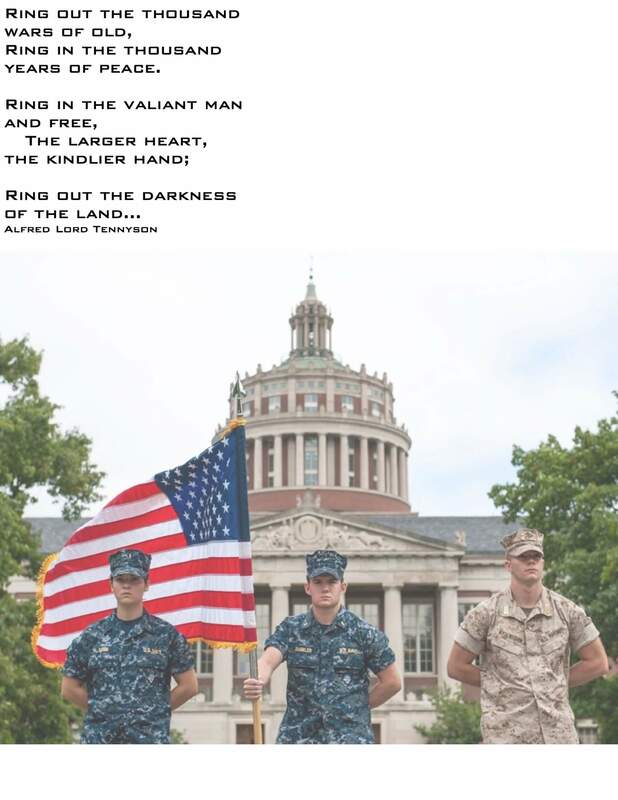 To honor the men and women–the valiant and the free–who have served in the Armed Forces, including those from the University of Rochester community, past and present. 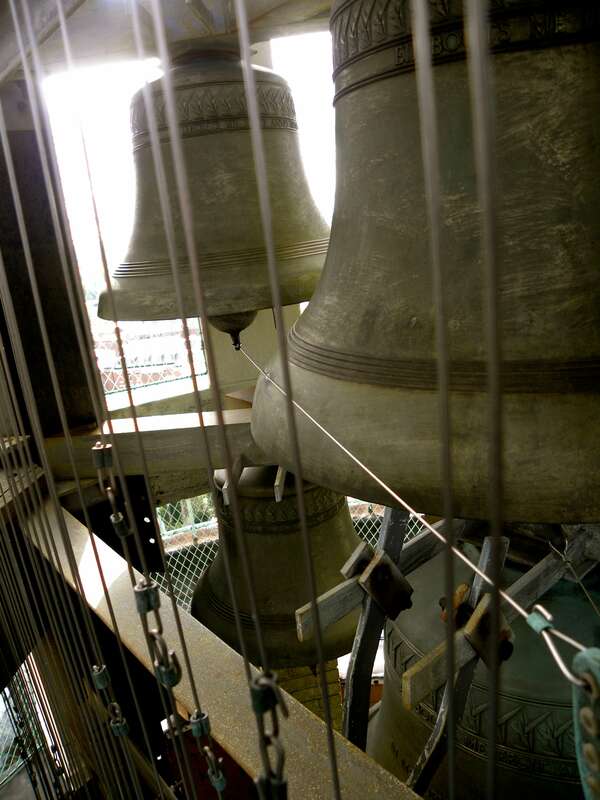 The Concert is one part of an ongoing celebration of the bells that have chimed since 1930. The centerpiece is the Hopeman Carillon Exhibition: Ring Out, Wild Bells in the Rush Rhees Library — a fascinating collection of photographs, newspaper articles, letters, graphic illustrations, old yearbook pictures and more. In a 1974 letter-to-editor of the Campus Times, cleverly titled, “For whom the bells toll,” two students, Bob Goldstein and Andy Wolf, complained about how the “interminable clanging bells” seriously disturbed their sleep. At that time, the chime may have been programed to ring the traditional “Westminster Quarters” on the quarter hour for 24 hours a day. So, their outrage was apparently justified. Come soak in the 85 year history of the Hopeman. Relive the days when the Bellman Society (1930 – 1973) reigned down from upper heights of Rush Rhees. 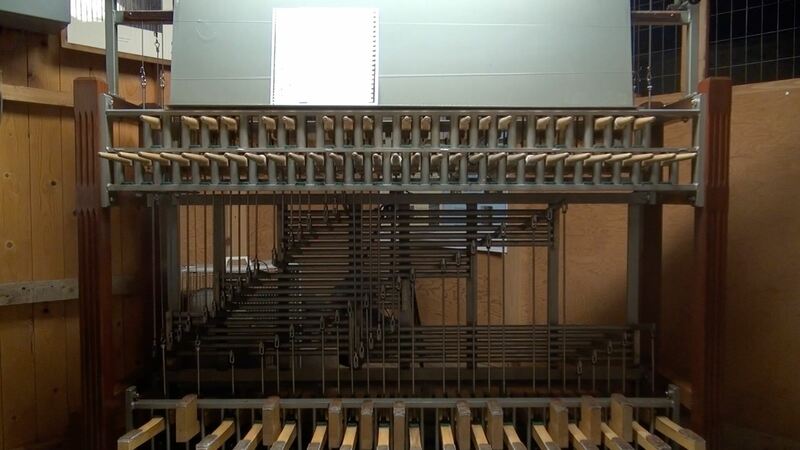 CONFESSION: Everything I know about the carillon comes from the extensive research done (exclusively for Talker) by students of carillon from the River Campus Music Department. By good fortune, I met the class instructor Doris Aman at the Ring Out, Wild Bells, exhibition, learning that one component of the course is a public relations project. I readily offered our blog as a venue for their presentation. The class answered the questions most commonly asked about the carillon. First–and foremost–what is a carillon and what does it sound like? Then, how is the carillon played? In her essay contribution, Yumeng Chen, from China, described the exhibit in Rush Rhees. To Yumeng, the exhibition was a look into history–especially American history–she does not often experience. The original chime from way back in 1930 most captured her imagination. She liked how the scattered historical pieces and artifacts, “the evidence”–come together to tell a story of the bells and their players. 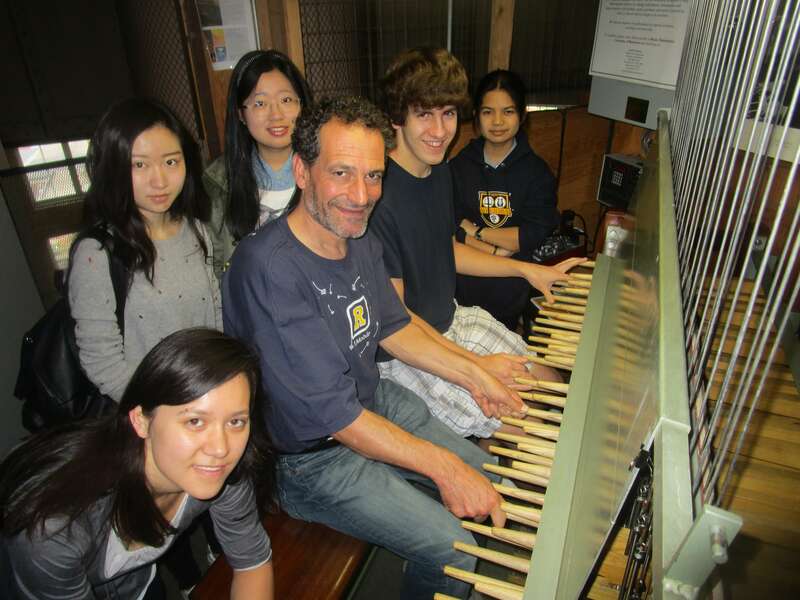 As you can see, students welcomed me into the carillon cabin as a special guest, playing for me as an impromptu gift. Typically people think the bells ringing are always a machine. If we hear the Westminster chime ringing the hour, the bells are being activated by an electromagnetic impulse, a machine. Now we can all realize that if we hear music in between the Westminster hourly chime, human beings are playing the bells. We within hearing distance love the bells. And, now more people in our community can now learn to ring. 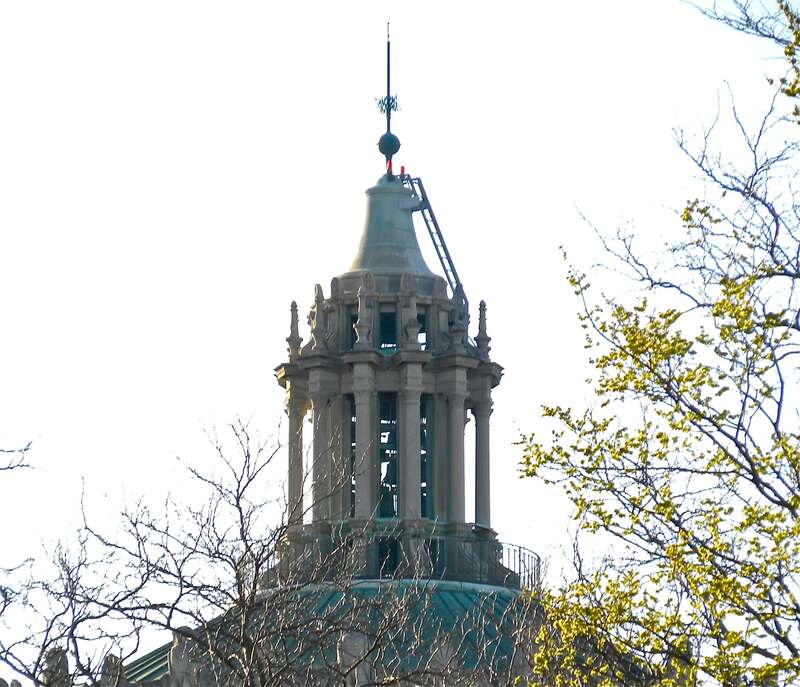 Eastman Community Music School has recently begun offering carillon lessons. For inquirers to try the instrument, a tour of the carillon is available to Eastman Community Music School students and affiliates. Contact Doris Aman for further information and dates. 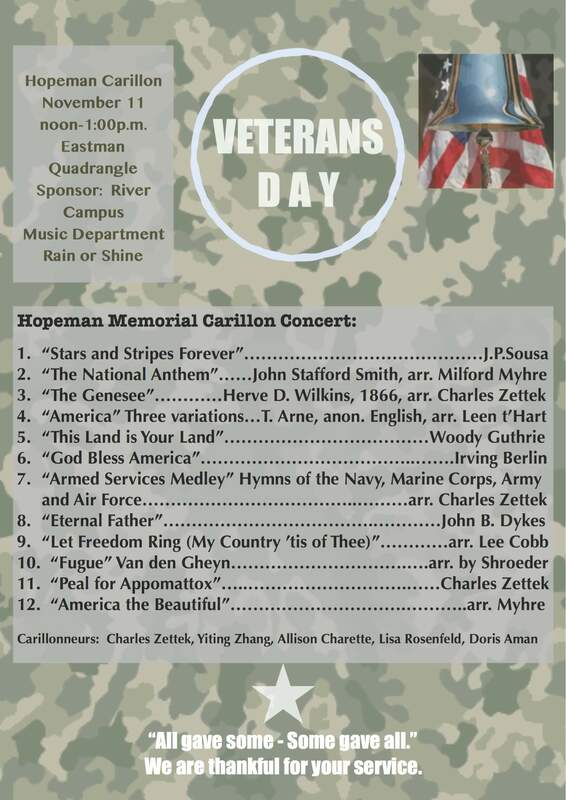 The Veterans Day concert will be played by a team of community members, alumni, and current UofR students. Their intention is to express gratitude to our servicemen and women for their service to our country. It is an honor and privilege to ring the bells for them.